If you love the look and feel of a big American-style family home, then this is the project for you. 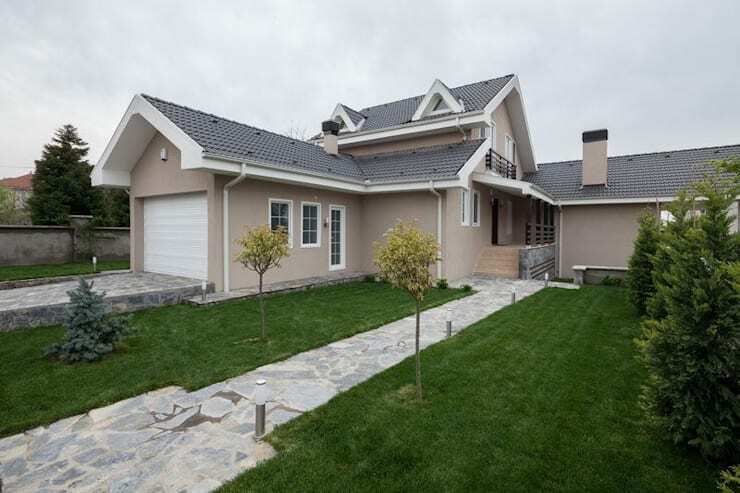 The home covers a vast 315sqm and has gables, a peaked roof, soft beige walls and a white trim. In short, it is an ideal family home that belongs in a movie. The classic American-style exterior has a lovely peaked roof with gables and a storybook look. The first feature we come across is the garage on the left. It is well integrated into the main residence and has a few side windows for light. It could easily be used as a workshop or storage room as well. This kind of integrated garage design can be good for those who want a side entrance for extra privacy. Inside, we have an extremely smooth and subdued living room with lots of space. The soft grey walls, feature stone-wall and wooden floor work together to create a very neutral and calming aesthetic. It's interesting to see the wall between the living room and the dining room cut out to reflect the peaked shape of the roof. Also, note how the broad white steps also double as a support base for the sofa to the right. The dining table seats a total of 12 people. 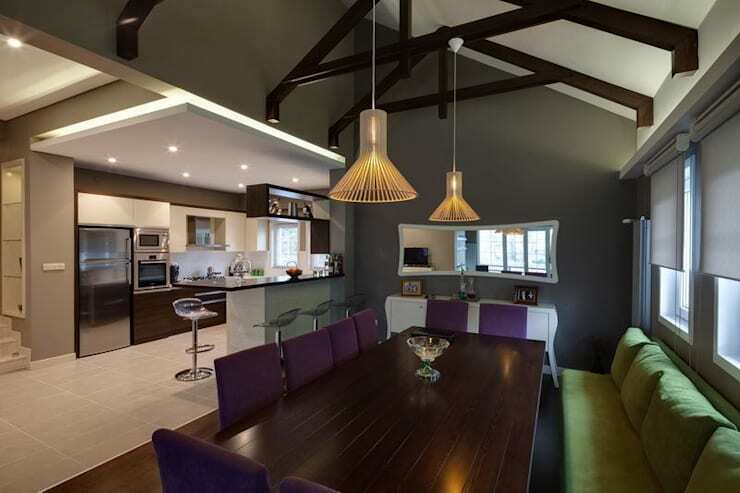 Dining rooms also benefit from a more formal approach, and here we can see that in the dark grey walls and the purple fabric covered dining chairs. Again, the room is generously proportioned and kept sparsely furnished. The variety and warmth comes from the dark wall and floor treatments. 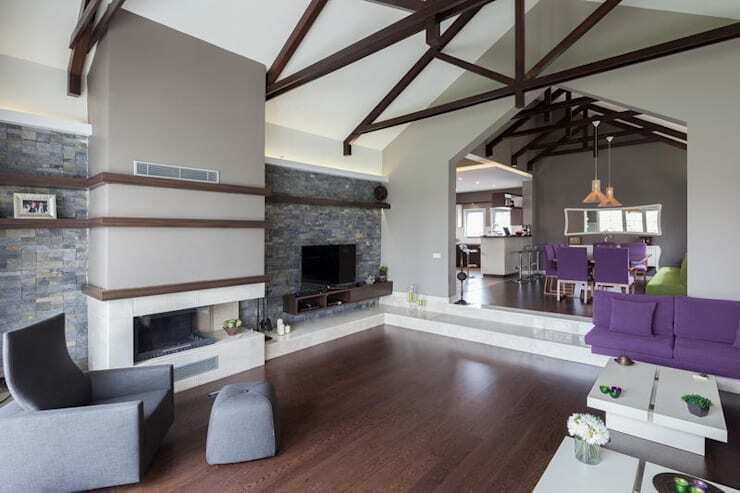 The one big defining element in this huge family home is the exposed wooden ceiling design. 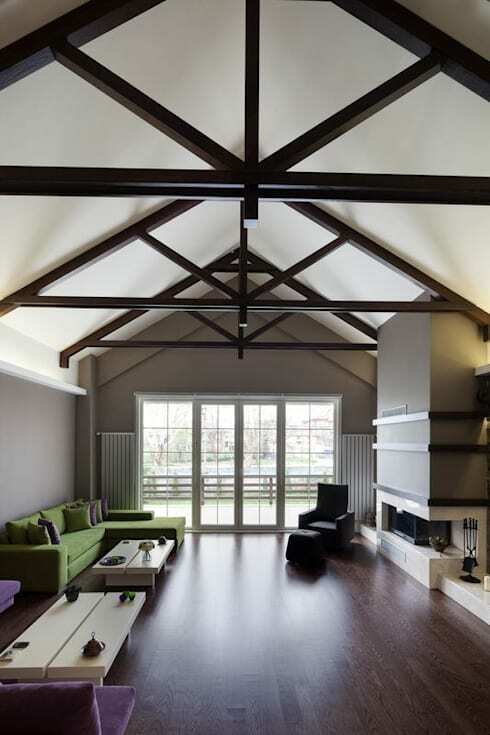 The wooden beams are shaped to draw attention to the peaked shape of the roof. This adds a very inspiring quality to the home and really lifts it apart from a standard family home. Note how the dark wood adds a sense of drama to the home too. A big family home needs a big and functional kitchen. 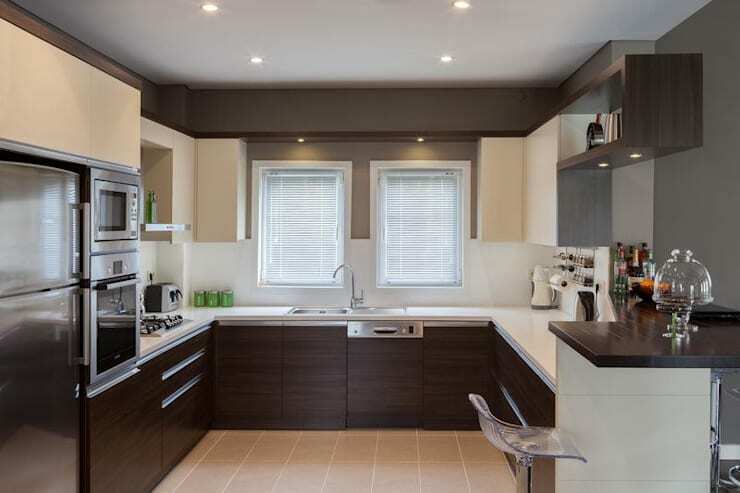 This one has lots of kitchen storage space and wall mounted kitchen appliances. The decor is primarily monochrome, but there are some wooden accents for added warmth. It's interesting to see how the base cupboards are dark and the upper wall cupboards are white. This really serves to lighten up the kitchen aesthetic. Also, check out the little breakfast bench on the side and the combination of closed and open wall cupboards. 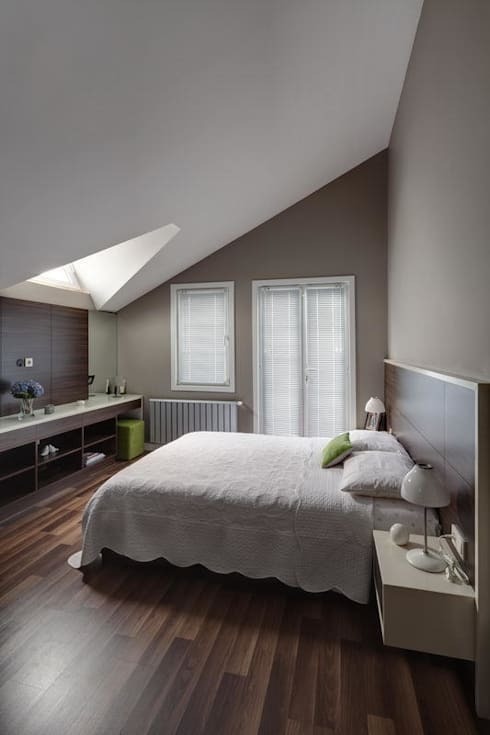 Grey is an incredibly soothing tone to use in the bedroom. Here we can see how well it works with wooden floorboards and white accents. The loveliest aspect in this soothing, grey bedroom has to be the gabled window. It adds some old-world charm to the bedroom and makes everything feel slightly whimsical. It's also a clever way to make the most of the lowered height of that side of the room. Let's have a look at another family dwelling… A charming family home you'll want to own. What do you think is the defining feature in this home?